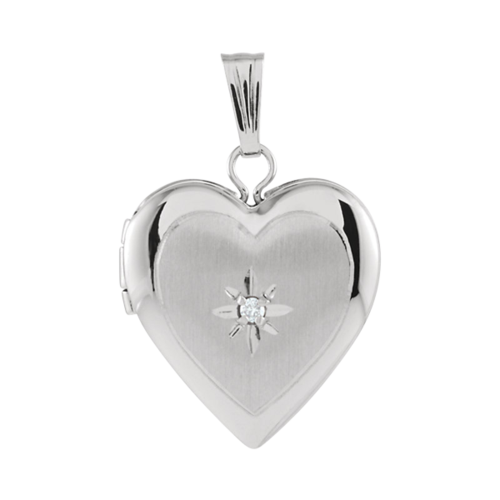 Adorable 14k White gold Dainty Diamond heart locket. 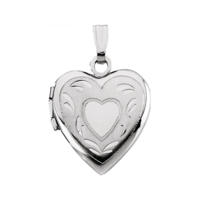 This locket measures 13.5mm top to bottom of heart before the bail by 12.75mm across. Special little locket will hold 2 of your precious photos. Diamond accent at this lockets center is a .01ctw. size. 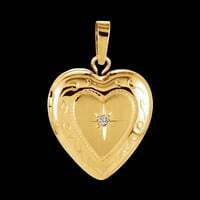 Lovely 14K Gold Sacred Star Heart Locket will protect your loved ones photos and keep them next to your heart. Locket measures 13.5mm x 12.5 or around 1/2 inch, a very small but pretty locket. Engraving possible on this item. 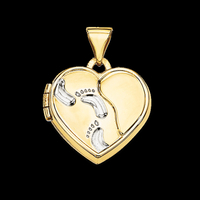 Cute 14k two tone gold heart shaped footprint locket. This locket measures 15mm in diameter and will hold 2 photos. Finish is polished on this locket. Locket is VERY light weight which explains the low price. Back has a lovely sentimental engraved message. 14k Gold small diamond accent locket. This locket measures 13mm in length by 11mm across, an beautiful locket. Will hold 2 photos. Simple clean polished locket. 14k Gold victorian inspired small locket. This locket measures 13mm in length by 11mm across, an beautiful locket. Will hold 2 photos. 14k Gold embossed floral design small locket. This locket measures 13mm in length by 11mm across, an adorable gift idea. Will hold 2 photos. 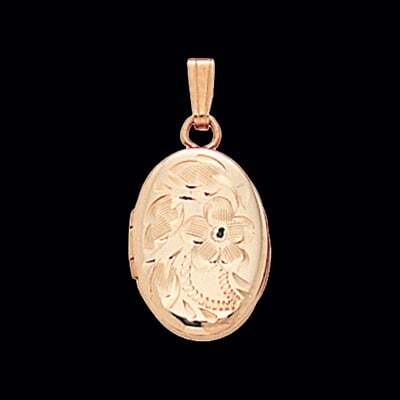 14k Gold diamond cut floral design small locket. This locket measures 15mm in length by 9mm across, an adorable gift idea. Will hold 2 photos. Locket will hold 2 of your special memories. A Locket is such a special piece of jewelry, one that is often passed down through the generations. 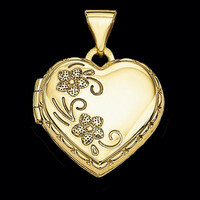 Lockets are great gifts for new moms, graduation, mothers day, valentines, birthdays, retirement, and Christmas. Really any special lifetime event or memory. 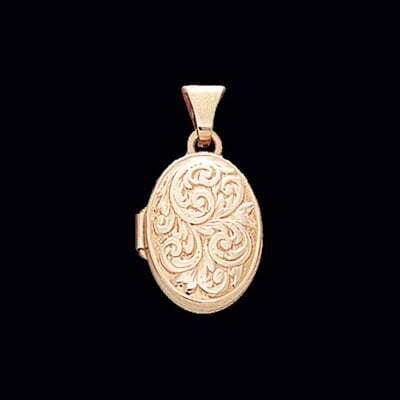 If this design isn't for you be sure to search through the many, many 14k yellow gold or white gold lockets. 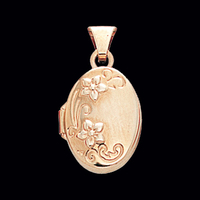 14k Gold polished petal design small locket. Locket features a polished center oval surrounded with a larger satin oval then finished with a lovely polished petal border. This locket measures 13mm in length by 11mm across and will hold 2 photos. 14k Gold embossed scroll design small locket. This locket measures 13mm in length by 11mm across, an adorable gift idea. Will hold 2 photos. Butterfly design gives this locket a whimsical style all it's own. 14k Gold Dainty etched butterfly locket. This locket measures 13mm in length by 11mm across, an adorable gift idea. Will hold 2 photos. Butterfly design gives this locket a whimsical style all it's own. Pretty 14k White Gold heart shaped locket. This dainty locket measures 17.5mm in length by 14.75mm across. Will hold 2 photos, great keepsake gift. Engraving possible on this locket, pick your font then add your sentiment to the customer comment during checkout. 14K Gold Locket available in solid high polished floral design. Aprox. 15mm. This Item is engraved on the back side with "Love You Always" What a wonderful gift. A locket lets you carry a precious memory in a fashionable and deeply personal way. This type of accessory reminds us that memories are priceless and old-school accessories don’t always go out of style. Browse our selection of elegant small lockets and find one that suits your taste! Lockets are all about form and function. A number of women choose to wear large lockets, a statement piece in any outfit. Most women wear the mid-sized ones which are the most common size of lockets available now. However, if you’re looking for a more unique style, a small gold locket is perfect for you! Small lockets are pretty accessories that bring life to your wardrobe, and are ideal gifts to your loved one for any occasion. Throughout history, lockets have been used more than just for adornment. Lockets have been keepsakes for soldiers and their special someone during World War II, mourning during the Victorian era, and symbolic gifts for newly married couples. Besides being nice pendants, several small lockets can also be worn as charms on a bracelet. Because of their size, they are not awkward or too heavy to wear, nor are they too distracting or showy. If you want to carry a special photo or something representative of any precious memory in a more subtle manner, choose small lockets from Gracious Rose. The most common shaped lockets are hearts, ovals, and rounds. They also come in different precious metals, but silver is probably one of the most popular types because it is durable and malleable. Silver jewelry is also believed to shield the bearer from any negative energy; making it a deeply sentimental and memorable gift for your special someone. Mother’s day – A locket containing her children’s baby photos or birthstones will surely make her happy! Valentine’s day – Get creative and give your girl a unique locket with a folded note or a pressed flower inside. Anniversary – Have your chosen locket engraved with your anniversary date or your names. Christening – A child will appreciate that meaningful present even more as he or she grows up. Gracious Rose also features family lockets that can hold up to four or more photos which could become an heirloom! Lockets really are such wonderful presents and they can be cherished for a lifetime. Nothing says “I love you” more than an elegant locket with a personalized message engraved on it. Once you have chosen your locket from our website, you will find a list of fonts to choose from, and a dropdown menu of varying chain lengths. All jewelry from Gracious Rose is elegantly handmade from ethically-sourced precious metals and gemstones. We offer unique designer jewelry at a price you can afford! Our jewelry consultants are always ready to answer your queries regarding our products for your shopping convenience. Find the finest gift for your special someone at Gracious Rose. Order now and get free shipping on orders over $250!